"You can make these into braids or buns. Frost with an orange icing and sprinkle some nuts on top, if desired." Stir butter and 1 teaspoon sugar into the hot milk until butter is melted. When mixture is lukewarm, stir in yeast and set aside for 5 minutes. When mixture is creamy, transfer to a large mixing bowl. Mix in 2 cups of bread flour. Add 1/2 cup sugar, eggs, orange juice, orange zest, and salt and beat until combined. Add remaining flour, mixing well after each addition, until it pulls away from the sides of the bowl. Knead for about 10 minutes. Transfer dough to a greased bowl, cover with plastic wrap, and let rise until doubled, about 1 hour. If time permits, you can punch dough down, cover it, and let it rise again. Transfer dough to a lightly floured work surface. Cut dough into 3 balls, cover with plastic wrap, and let rest for 10 minutes. Preheat oven to 375 degrees F (190 degrees C). Lightly grease two baking sheets or line with parchment paper. Shape each piece of dough into braided loaves or buns; place on baking sheets. Let rise until doubled, about 30 minutes. Bake until rolls or loaves are golden brown, 10 to 12 minutes for individual buns, about 20 minutes for braids. 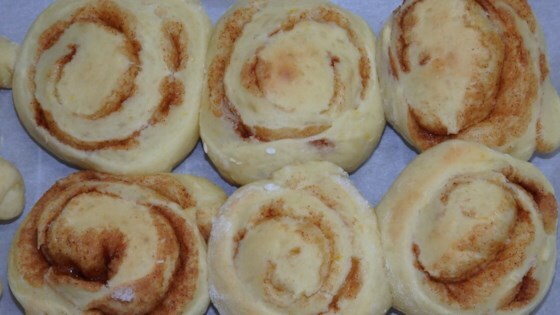 Frost rolls, if desired (see Cook's Note) or sprinkle with confectioners' sugar. These amazing sticky buns are topped with pecans and a luscious caramel sauce. I made 1 braid, 12 cinnamon buns, and 12 butterhorns with this recipe. Very time consuming, but worth it! My sister and I have been making this bread for special occassions for years...YUMMY! The bread was so light and fluffy! Following the cook's notes, I made a few into cinnamon rolls. I also mixed up a marmalade-chocolate sauce to go on some plain rolls! Super delicious!!! the dough was very good.. nice consistency but I would not divide it into 3 ball.. I found I like larger buns or bread so I would divide into 2 then make bread and buns..